Hello Everyone, Based on last night's footage of @Kemen_fitness making sexual moves on @officialtboss_ which sparked a large outrage, we will like to make our stance known on this matter. 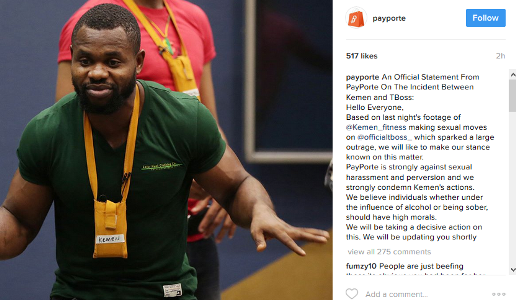 PayPorte is strongly against sexual harassment and perversion and we strongly condemn Kemen's actions. We believe individuals whether under the influence of alcohol or being sober, should have high morals. We will be taking a decisive action on this. We will be updating you shortly.